A new poll done by the Washington Post and Kaiser Family Foundation backs the oft-quoted—and lately, often disputed—Justice Department statistic that one in five college women are sexually assaulted. The poll surveyed 1,000 people who attended college in the last four years and found that twenty percent said they were sexually assaulted. The survey asked about other forms of unwanted sexual contact—attempted sexual assault, non-physical coercion, and a suspected assault while the subject was incapacitated—and found that 11 percent of women and two percent of men had suffered an attempted assault. The Post-Kaiser survey calls alcohol a “major” risk factor, as well as students who said they were involved in hookups “from time to time” (so, uh, most college students). Schools with fraternities and sororities also had increased risk, but other factors—public versus private, “party schools,” religious affiliation—made no difference. The last fascinating tidbit from the survey deals with perception, not reality: 58 percent of men believed that at their schools, fewer than one in five women were assaulted. The same percentage of women thought the number was probably greater. 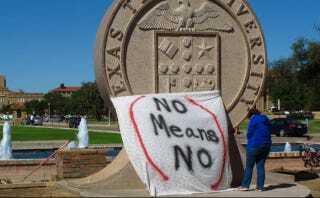 Students at Texas Tech drape a protest sign over a school seal on the Lubbock campus, October 2014. The students were protesting a picture of a banner at the Sept. 20 Phi Delta Theta fraternity gathering, which read “No means yes.” The fraternity was subsequently stripped of their charter. Image via AP.